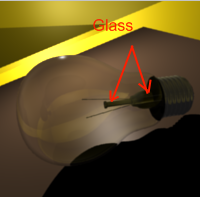 Here is the simple picture with two “glass” objects. They looks not like real glass but you see white shape, there is the problem. How to make that white shape will be also like glass with crossing lines. 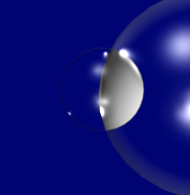 First time the white shape was black, I turned off Shado button in Shaders tab. I need to put one glass object inside another, but I don’t know how to make him inside glassy. There’s another and real picture, where inside should be glass element.